Ultimate Camera Control - Introduces several new camera modes as well as allowing you to zoom down to ground level. 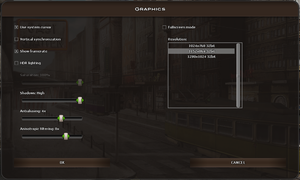 No frame rate cap; to set a cap see Set maximum frame rate. 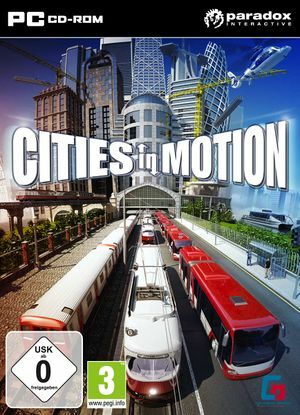 Cities in Motion does not limit FPS by default. This can potentially cause overheating of your computer. Fine the line $fpsLimit = 0.0; and set it to the desired value. Since the game engine is poorly optimized, the game may have trouble on many computers. The following settings might make a difference in performance. If the game will not load, try forcing the game to run in a window. Change $fullscreen = true; to $fullscreen = false;. If you are running the game on an ATI/AMD card, then placing an older version of an ATI DLL file in the installation folder may allow it to work. Download the necessary .DLL file here. Go to where the game is installed and copy that DLL file there. If the game still doesn't work, go to the configuration files location and delete settings.script. Integrated video cards are not supported.